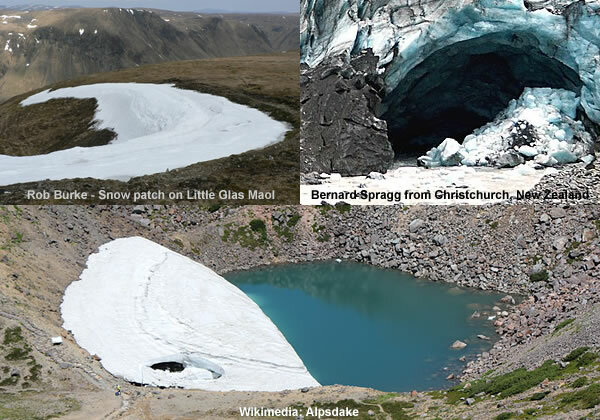 The Colle Gnifetti glacier has become a winter wonderland for Earth Scientists in recent years. Determining whether the avalanche of information produced by these Earth Scientists contains solid science or frozen turkeys is an illuminating exercise. The Colle Gnifetti glacier is at 4.450 metres above see level on the Monte Rosa massif that straddles the border between Switzerland and Italy. The snow accumulation is strongly variable ranging between 0.3 m w.e./a at wind-exposed saddles and ridges and 2-3 m w.e./a at wind-protected sites (Gäggeler et al.. 1983: Haeberli et al., 1983; Alean et al.. 1983; Fichier et al.. 2000). The observed ice depths in the study area range from 40-120 in at wind-exposed crests and saddles, and from 80 to more than 200 in in the central part of firn basins (Haeberli et al.. 1988; Vonder Mühll and Funk, 1995; personal communication from G. Rossi, 2001). Spatial Occurrence, Surface Energy Balance and Climatic Evidence. Although analysing ice cores from the Colle Gnifetti glacier is a popular pastime amongst Earth Scientists there are several issues that complicate and confound their studies. The observational data indicates the internal temperatures of the Colle Gnifetti glacier fluctuates down to [at least] 25 metres i.e. roughly 50 years worth of ice. If ice temperatures are above -15°C then cryophilic microbes thrive and reproduce i.e. this appears to apply to the entire Colle Gnifetti ice column. 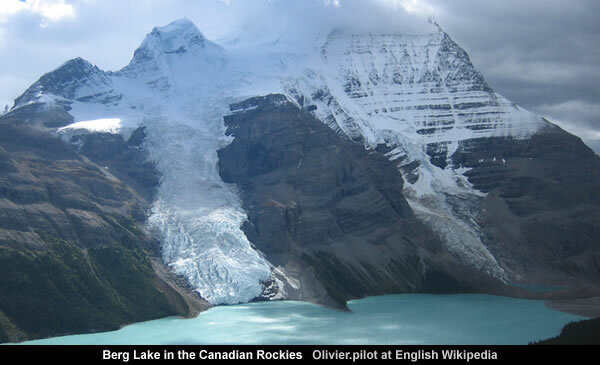 The exclusion of cryophilic microbes became necessary when the glaciologists discovered [the hard way] that cryophilic microbes have a nasty habit of growing and reproducing at temperatures between -15°C and +10°C in “polar ice, glaciers and snowfields”. Less hardy microbes will die and decompose in the first 100 metres of Colle Gnifetti ice. The striking suggestion that many microbes die and decompose in the first 100 metres of an ice core might just explain why it was difficult to splice CO2 ice core data onto the Mauna Loa dataset. Overall, these microbes slowly alter the chemistry of the ice. It can be difficult to reconcile ice core CO2 levels with atmospheric CO2 levels. The gradual compression of snow into firn and ice enables entrained gases to diffuse throughout the [roughly] uppermost 70 metres of the Colle Gnifetti ice column. The bubbles at a certain depth are not occluded at the same time. This implies that in a given sample the age of the air in individual bubbles is different. In addition air needs a few years to diffuse down to the depth of bubble enclosure, also leading to a secondary broadening of the age distribution of the air at a certain depth. Both effects lead to a low pass filtering of atmospheric records in ice cores. The air at the depth of bubble enclosure communicates with the atmosphere via the open pore space. Over large parts of the firn column the gas transport is diffusive. This leads to gravitational fractionation as well as thermal diffusion effects, which are important when considering isotope records in atmospheric gases. Arguably, the most confounding feature – especially for chronologists – are the large number of melt layers found in the Colle Gnifetti glacier. This is an issue chronologists prefer to avoid discussing because in their grand schemes [that span tens and hundreds of thousands of years] there are plenty of opportunities for ice layers to melt away into oblivion i.e. there can be chronological gaps in any ice core with melt layers. One of the more intriguing aspects of the Colle Gnifetti glacier is that it produces surprisingly inconsistent results. Snow on the Colle Gnifetti glacier accumulates mainly during the summer because the dry winter snow is subject to wind erosion. The Colle Gnifetti glacier is characterized by a ice thickness reaching 60 to 130 m in the central saddle area [Luthi and Funk, 2000], and by a low net snow accumulation of about 33 cm water equivalent per year (weq) resulting from the preferential wind erosion of dry winter snow [Doscher et al., 1995]. Because of preferential wind erosion of light winter snow at this site, the glacier saddle accumulates snow mainly during summer and mean annual snow accumulation is only 0.454 ± 0.033 cm weq, implying preservation of more than the last 1000 years at a reasonable temporal resolution and, furthermore, the presence of more than 10,000 year old ice near the bedrock [Jenk et al., 2009]. However, it’s important to remember surface mass can be lost at any time via wind erosion, sublimation and evaporation. 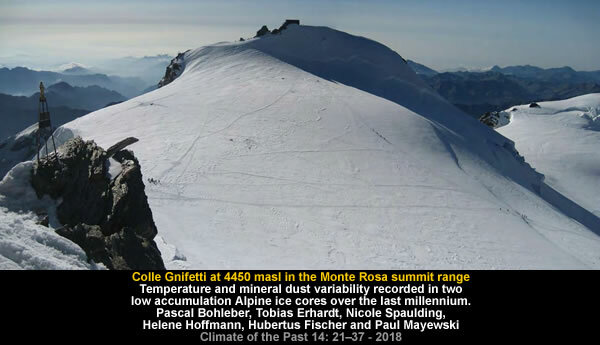 When the Colle Gnifetti glacier isn’t accumulating mass it is actively losing mass. Therefore, it’s debatable just how much of any year is reflected in the Colle Gnifetti ice. For chronologists there is the unanswerable question of whether any original ice really remains at the base of a flowing glacier i.e. models and maths only provide theoretical answers. And for chronologists who really like to push the envelope there is always the question [they prefer to avoid] of what exactly is being sampled at the bottom of an ice core. Residual pockets of ice that pre-date the glacier? Multiple layers of refrozen summer melt water? The only obvious clues [given by the mainstream] regarding these “brown sludge” layers is their remarkable thickness [11 millimetres] and lack of compression. This question is particularly pertinent in Greenland where old glacier ice flowed over freshly frozen lakes of very young ice. This scenario creates an unthinkable and unmentionable chronology inversion in an ice core. When the Earth Scientists have scratched their heads over these tiresome issues they are still confronted by one rather stark observation. The Colle Gnifetti ice has only been validated down to 53.52 metres by reference to the Laki eruption of 1783/4. … the Colle Gnifetti CG03 Ice Core – which hit bedrock at 80.20 metres – was verified down to 53.52 metres by the Laki eruption of 1783/4. …volcanic “ash layers” are of very limited use because the chronology of volcanic eruptions is very “sketchy” before 1600. The usual volcanic suspects between 1600 and 1783 are missing from the Colle Gnifetti CG03 Ice Core chronology validation. Huaynaputina is a stratovolcano in a volcanic upland in southern Peru. The volcano does not have an identifiable mountain profile but instead is a large volcanic crater… On 19 February 1600, it exploded catastrophically (Volcanic Explosivity Index [VEI] 6), in the largest volcanic explosion in South America in historical times. The eruption of Hokkaido Koma-ga-take in June 1640, resulting in heavy ashfall and plants poisoning in Tsugaru Peninsula and nearby areas, has triggered the local crop failure, continuing to 1642. Hekla is a stratovolcano in the south of Iceland with a height of 1,491 m (4,892 ft). 1693 Starting 13 January and lasting for over 7 months the eruption was one of Hekla’s most destructive (VEI 4). This is not entirely surprising. The verified data suggests the Colle Gnifetti glacier dates back to only 1660 AD. While a visual inspection of the ice core suggests the glacier dates back to the 1680s AD. Overall, the evidence suggests the origins of the Colle Gnifetti date back to the dramatic downward spike in temperatures that was triggered by a series of natural events beginning in 1642. 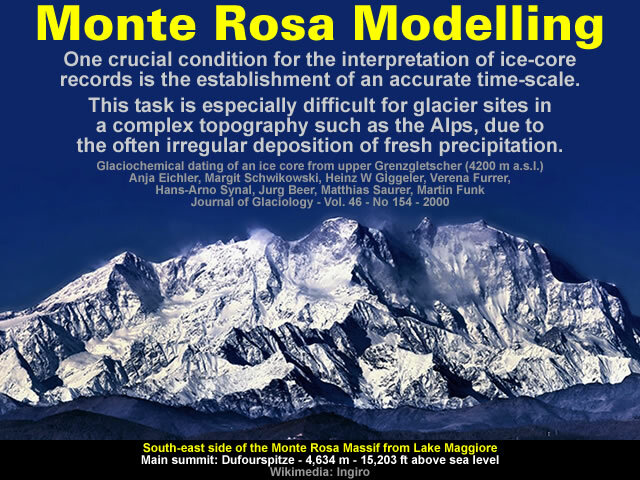 The absence of the usual volcanic suspects is also very good news for the Earth Scientists because they can create chronologies for the unvalidated section of the Colle Gnifetti ice core using the magic of mathematics and models to manufacture millennia. This technique was perfected for Greenland ice cores by Willi Dansgaard during the 1960s. The 16,000 year estimate produced by the Nye Model was rejected outright by Willi Dansgaard because he believed the age of the Greenland Ice Sheet exceeded the 40,000 year limitation associated with radiocarbon dating. Therefore, demonstrating a singular flare for confirmation bias, Willi Dansgaard developed his own Sandwich Model that produced a far more acceptable estimate of 160,000 years for the Camp Century ice situated 20 metres above the bottom. However, trying to apply Willi Dansgaard’s Sandwich Model to the measly 80.20 metre Colle Gnifetti CG03 Ice Core isn’t going to produce the right amount of millennia. Gallery | This entry was posted in Comets, Glaciology, Greenland, History, Monte Rosa - Colle Gnifetti, Old Japanese Cedar Tree. Bookmark the permalink.